As an actress, Whoopi Goldberg is best known for her first featured role in The Color Purple, and she has said she was high on marijuana when she accepted her Best Supporting Actress Oscar for Ghost. As a comedian, she is famous for performing mildly offensive material with a blasé but endearing "laugh or go to hell" delivery. Goldberg has always loved shocking the audience to silence, almost as much as hearing the laughter. Early in her career, her routine included spot-on cross-ethnic impersonations -- sexually active surfer chicks, down-and-out bums, pervert priests -- and then she would casually describe how she'd used a coat hanger to perform an abortion on herself when she was 14. She is often funny, but being aggressively blunt is also part of Goldberg's schtick -- an odd tactic for a comedian. Goldberg grew up in a housing project in New York City. Her father, a preacher, abandoned the family, leaving Goldberg's mother to raise two children alone. Goldberg has credited Nichelle Nichols, Uhura on the original Star Trek, as a key inspiration. "When I was nine years old," Goldberg says, "Star Trek came on, and I looked at it and I went screaming through the house, 'Come here, mum, everybody, come quick, come quick -- there's a black lady on television and she ain't no maid!'" Goldberg started on stage at the city's Hudson Guild Community Center, and eventually moved to California, where she did experimental theater and supported herself with low-paying jobs as a manual laborer. When she confided to her mother that she needed an outrageous stage name to match her material, something more memorable than "Caryn Johnson", her mom mulled it over and dreamed up "Whoopi Goldberg". In the 1970s, Goldberg sang chorus roles in stage productions of Hair, Pippin, and Jesus Christ Superstar, and performed in a Berkeley experimental group, the Blake Street Hawkeyes. There, she was "discovered" by director Mike Nichols, who helped get Goldberg's one-woman performance piece, The Spook Show, booked on Broadway. Goldberg's bitchy, angry, but funny pathos got strong notices, and got the attention of someone in Steven Spielberg's office. She was asked to audition for the lead role in The Color Purple, which was definitely not a comedy. The movie was a critical and popular success, Goldberg was nominated for an Oscar. She made a series of underrated comedies like Jumpin' Jack Flash and Burglar, played the wise bartender in Star Trek: The Next Generation, and won an Oscar as the phony psychic in Ghost. She also made several appallingly awful films before impersonating a nun in the amusing Sister Act and Sister Act 2. She starred in the compelling civil rights drama The Long Walk Home, but has mostly made her screen career in supporting roles. Goldberg's other memorable films include Clara's Heart, How Stella Got Her Groove Back, Boys on the Side, and Girl, Interrupted. She also had a short-lived TV sitcom, Whoopi; replaced Nathan Lane in a Broadway revival of A Funny Thing Happened on the Way to the Forum; and served as emcee at several "Comic Relief" performances, raising funds for homeless-related charities. Jumping past the boundaries of what's allowed on network TV, Goldberg filmed several comedy specials for HBO. She has hosted the Oscars ceremonies several times, always with borderline blue material. Her Oscar telecasts have twice been nominated for Emmys. In 1993, her then-boyfriend Ted Danson spoke in blackface at a Friars Club roast, in a bit later revealed to have been written by Goldberg. It was universally reported as having been in horrendously bad taste, and the photos of Danson in Al Jolson get-up were everywhere in the media for days. Goldberg thought it was hilarious, and still says so, though only the people who were in the room can honestly say, since nobody else has actually heard the material. She started her own company, One Ho Productions, in 1992, to produce and syndicate a late-night talk show, The Whoopi Goldberg Show. In 1995, One Ho revived Goldberg's favorite game show from her childhood, The Hollywood Squares, and Goldberg took Paul Lynde's old center square seat. In 2004, Goldberg performed at a fundraiser for John Kerry's presidential campaign, and made several off-color allusions to sexual synonyms for President George W. Bush's last name. A few days later, she was fired as spokeswoman for Slim-Fast weight-loss products. Steve Brown, "God's Weird Love", Today's Christian, January/February 2007. To Kathy Huffhines in the Dallas Morning News, 10 December 1991, she described herself as a "Jewish-Catholic girl from New York", though this is clearly a cultural rather than belief designation. Her approach to religion is flippant, saying that she changed her name to Whoopi "after encountering a burning bush in the desert." See Miami Herald, 2 June 1985. 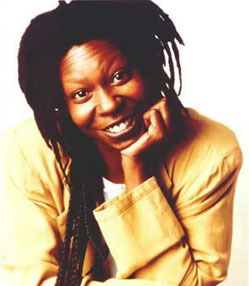 In an interview with The New York Times Magazine (20 August 2006), Whoopi Goldberg asserts: "No, I am not a lesbian. I describe myself as heterosexual. I think it is hard to have good relationships with anyone." Hollywood Walk of Fame 20-Jul-2001 at 6841 Hollywood Blvd.